Anytime you haul to an equine event chances are the parking is going to be horrible. There will be no shade, it will be on concrete or hard packed dirt that is worse than concrete, and good luck finding a place to warm up or cool down your horse. I strongly believe that what you do immediately before and immediately after an event has just as much to do with being successful as training and competing. This is why the Easyboot Cloud is the best tool in my arsenal to keep my horse performing her best. 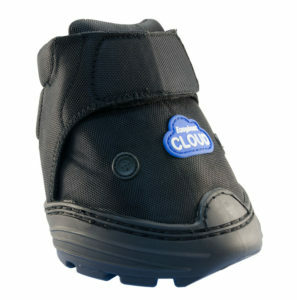 I set out to see if the Cloud could be beneficial in cooling structures of the lower leg. 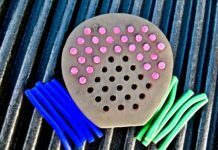 We love feet here at EasyCare, but we also like to see what other benefits our boots may have on other parts of the body. To test the Clouds in a real life situation, not in a controlled environment, but in a situation that our customers and myself will be using the boots in, I put them on my mare and hauled her to a rodeo event. When I unloaded her from the trailer, she appeared more comfortable. With the Clouds on she stood quietly and didn’t seem to be adjusting herself nearly as much. She is a very fidgety, nervous, high strung horse so anything I can do to keep her relaxed before running is a bonus. 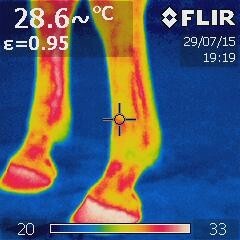 The next part of my test involved using an FLIR thermal camera to check the cooling of the lower leg structures. If you’re wondering why it’s important to cool off the lower leg of your horse, it’s because the tendons are like giant rubber bands and during an event they are stretched to the max. The faster you can cool them off and return them to a normal state the less likely you are to have swelling and inflammation, which shortens the recovery time. 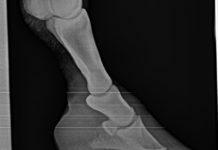 If you have ever had a horse with a ligament or tendon injury you know how long the recovery can be, months or even years, if not career-ending. 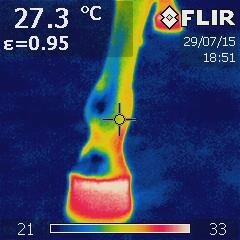 What the FLIR camera does is allow you to see the actual temperature of an object or in this case lower leg. The FLIR is an infrared camera that reads infrared heat and turns it into an electric signal which is then turned into a thermal image that then processes temperature calculations. Much more accurate than the ol’ back of the hand to the forehead “you have a fever” your mama used to use! Using the FLIR after the run, I saw that the Easyboot Clouds successfully aided in cooling the lower leg and all of the important structures below the knee: the superficial digital flexor tendon, deep digital flexor tendon, dorsal digital extensor tendon, etc. Another post-run benefit of the Clouds is how quick they are to apply. I’m an avid poultice user but it takes quite a bit of time, which I don’t have immediately after a run. Here are some basics for understanding how to read FLIR images. Yellow or white indicates a hot spot, but it’s not the only signal. It’s all relative to the temperature scale. If you have the same temperature scale reading, then yes, two pictures could be compared off of color result alone. If you are taking an image of two limbs in the same shot, those could be compared, apples to apples. But if you take a shot and a second shot, you will have to check your scales before deciding that one limb being yellow and another one being bright white is actually a good comparison. In the images above, we might think they are the same reading because the colors look the same to us. But if we look at the scale that the FLIR calculated, we see that one has a high of 92.3 degrees and the other a high of 82. This means that the heat spots in the left image are actually much hotter than the image on the right. The next two photos show both front legs before the warm-up. Notice that there is a Celsius temperature reading in the left corner and there is a target at the location the camera is getting the reading from. You can see that her left front was 26.9 Celsius and her right front was 27.3 Celsius. My mare had the Clouds on for about an hour before we took the photos. The scales detected were the same, so we can just compare color to color if we want to glance at it. Additionally, the FLIR pinpointed an exact temp for where it was aimed, specifically. In the next set of photos I did a light warm-up, about 10 minutes of trotting and some loping. My horse does not require extensive warm-up – just enough time to get all those muscles moving and make sure everything feels right. I do a lot of walking before my runs to insure she stays warmed up but does not get too excited. We then put a Cloud only on the left front foot. I hand walked her for a little less than 10 minutes. As you can see, the left front leg that had the boot on was about 2 degrees Celsius cooler than the right leg. Since I’m better with Fahrenheit, here are the conversions: left front 83.4 degrees Fahrenheit, right front 86.9 degrees Fahrenheit. The scales picked were almost the same, for the sake of visually comparing the reds-whites of heat from limb to limb. The next set of photos are post-run. I did ride her around right after our run so she could get her air back but after that, we did the exact same thing. I only put the boot on the left front and then I hand walked her for about 15 minutes. As you can see there is a 3 degree Celsius difference: left front was 82.5 degrees Fahrenheit and the right was 87.9 degrees Fahrenheit. Again, the scales picked were identical, so we can visually compare the color readings as well. 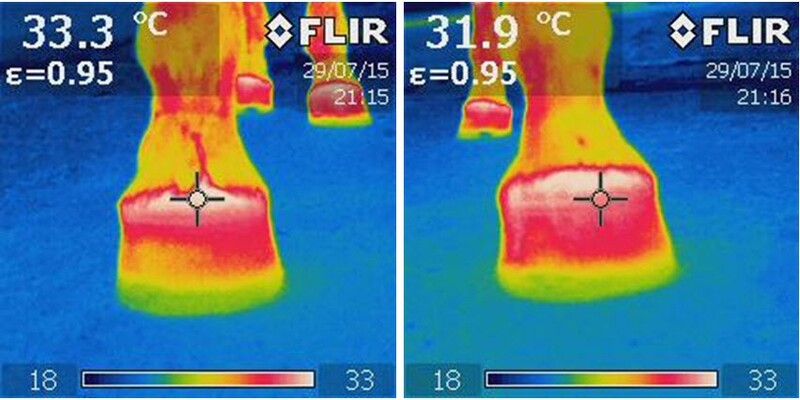 Interestingly, in scanning the hooves where the pastern had cooled down uniformly (despite having a boot wrapped around it), the hoof is also uniformly heated from the coronary band down to the hoof. Again, the hoof was in a boot. The other pastern and hoof have not cooled down uniformly and still show the heat of the two suspensory extensor branches, wrapping to the front of the pastern. 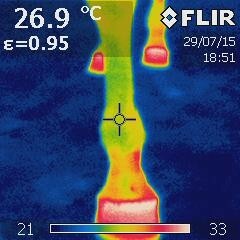 I knew that the Easyboot Clouds would make my horse more comfortable while hanging around waiting to run but I’m glad that I performed further testing using the FLIR camera. Now I have proof that these boots make a difference in cooling down the lower leg and help aid a quick recovery.